حجم هذه المعاينة: 757 × 599 بكسل. الأبعاد الأخرى: 303 × 240 بكسل | 607 × 480 بكسل | 758 × 600 بكسل | 970 × 768 بكسل | 1٬280 × 1٬013 بكسل | 3٬133 × 2٬480 بكسل. Peinture française، room 77: Mollien. Denon، 1st floor. ١٨٣١ : acquired by Luxembourg Museum, باريس from Eugène Delacroix. 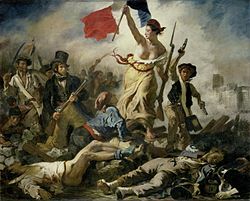 لهذا الملف عدة صور مستخرجة: File:Eugène Delacroix - La liberté guidant le peuple (cropped).jpg. حصل هذا الملف على ترشيح في صورة العام للعام ٢٠٠٦. This image was selected as a picture of the week on the Persian Wikipedia for the ٤. week, 2011. The author died in 1863, so this work is in the public domain in its country of origin and other countries and areas where the copyright term is the author's life plus 100 years or less. 10:06، 14 أغسطس 2005 1٬241 × 1٬022 (172 كيلوبايت) Yann same image with bigger resolution.